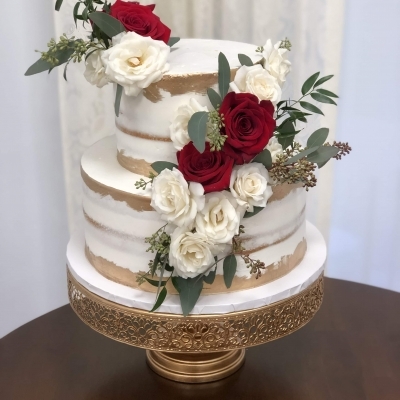 Beautiful 4 tier naked cake, with fresh flowers and berries. 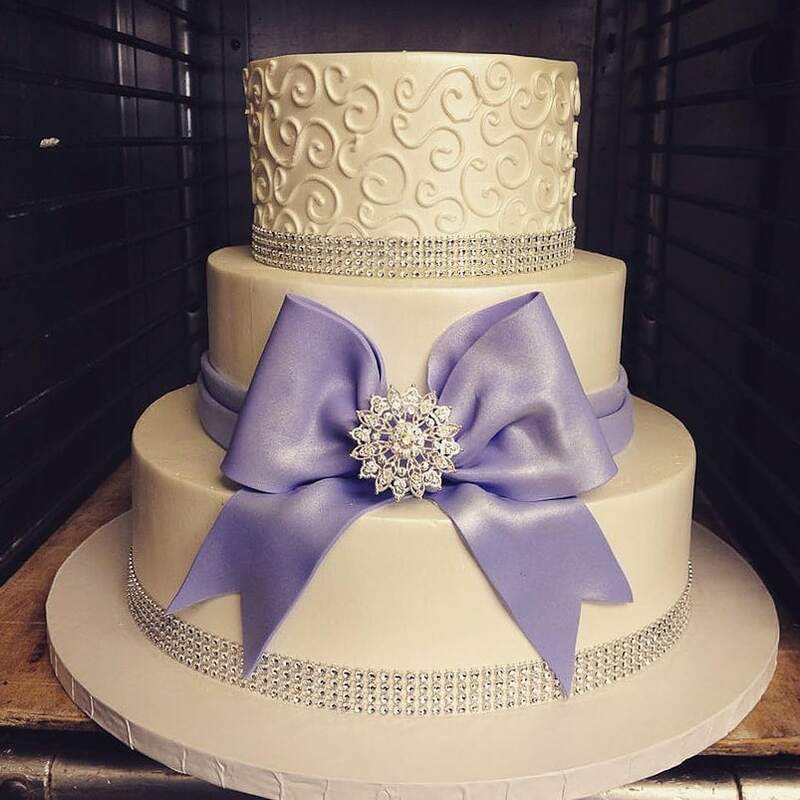 This beauty is 4 tiers iced in white buttercream, with detailed piping and beaded borders and fondant monogram. 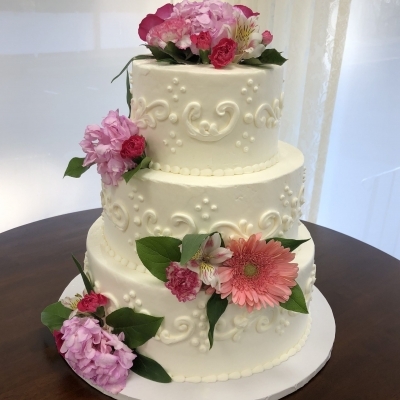 Garnished with fresh flowers throughout the cake. 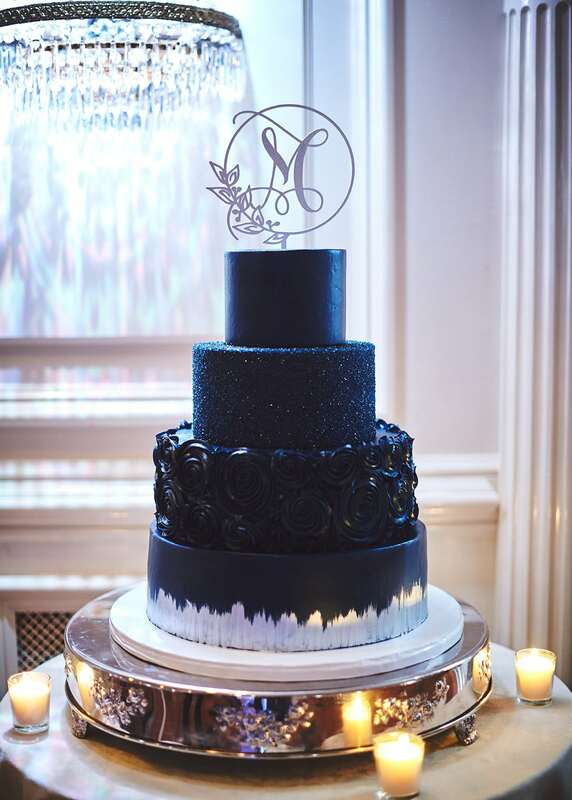 This strikingly unique wedding cake was iced in a midnight navy blue buttercream, with silver brush strokes on the bottom tier, rosettes on the next tier, crystal sugar on the next and a simple smooth top tier. 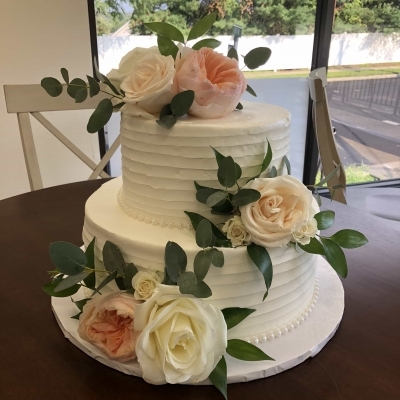 Beautiful 4 tier naked cake with fresh roses and greenery. 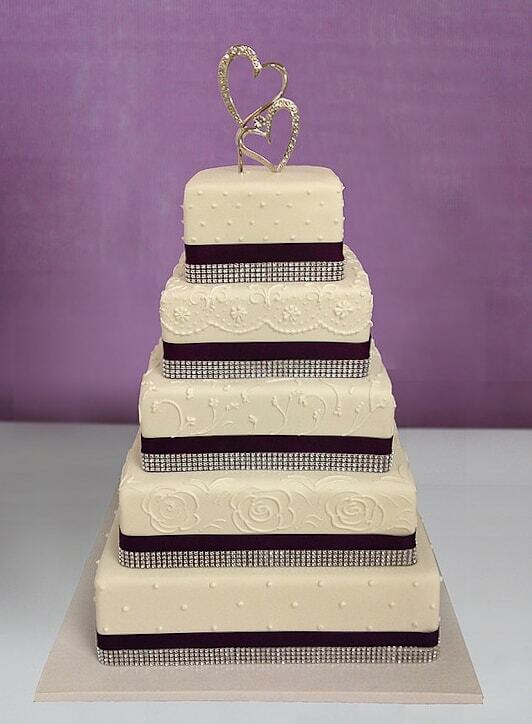 This cake shows 3 tiers of vanilla cake with one contrasting chocolate tier in the middle. 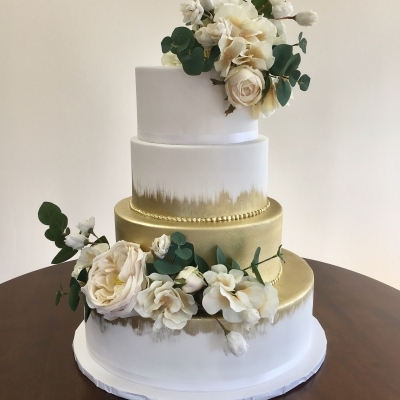 This beautiful naked cake is accented with gold edges and fresh flowers. 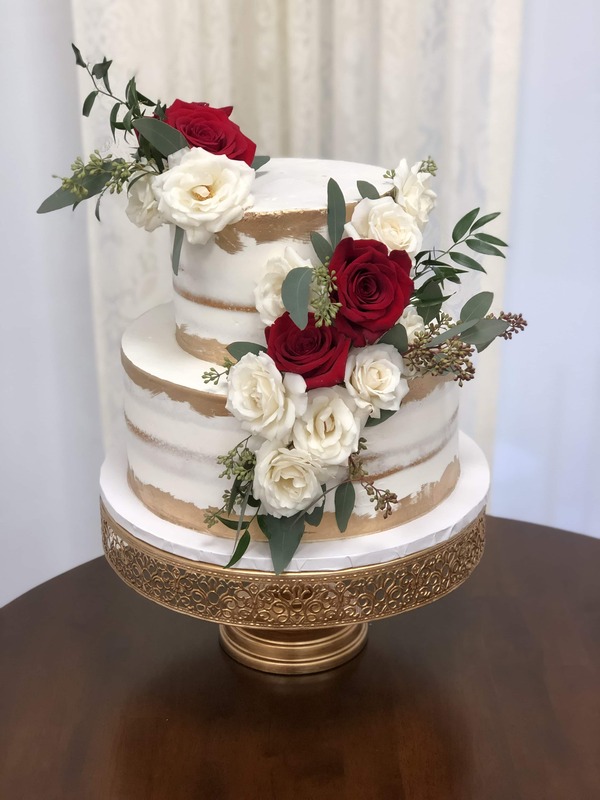 The red roses really pop against the clean white buttercream and gold finish. 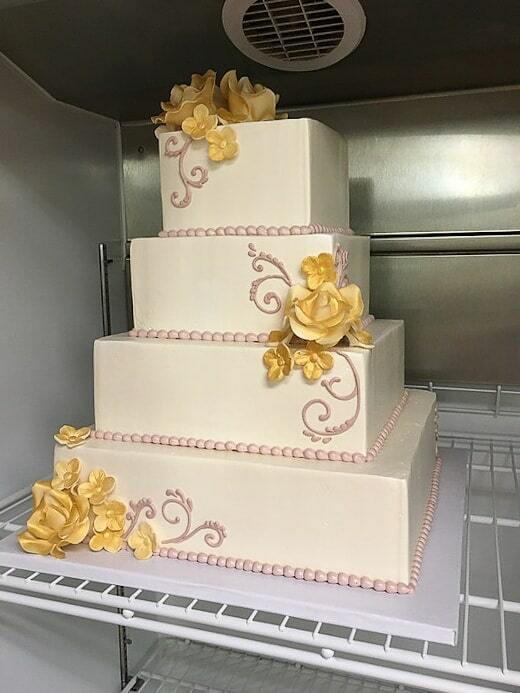 This 3 tier cake is created using all fondant, with a pretty quilted pattern on the bottom tier and a separator to add in beautiful fresh roses. 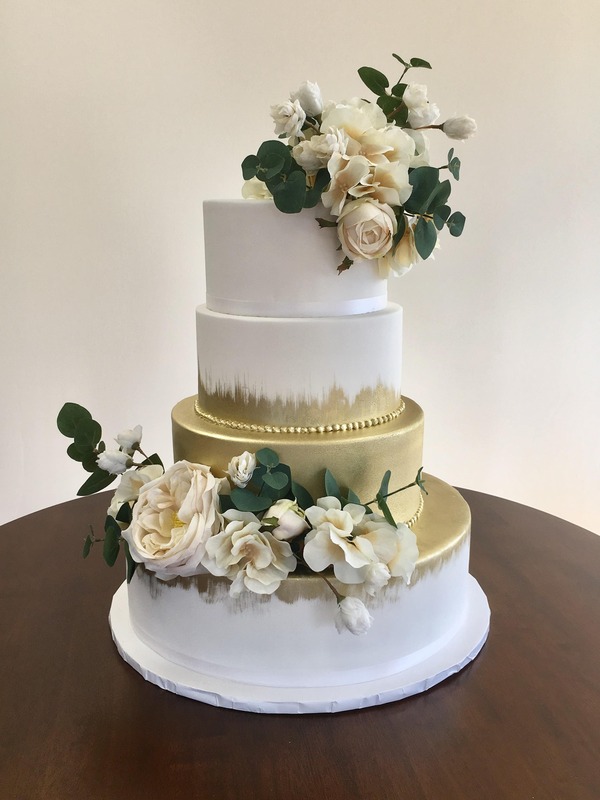 This 3 tier gold sugar ombre wedding cake really sparkles! 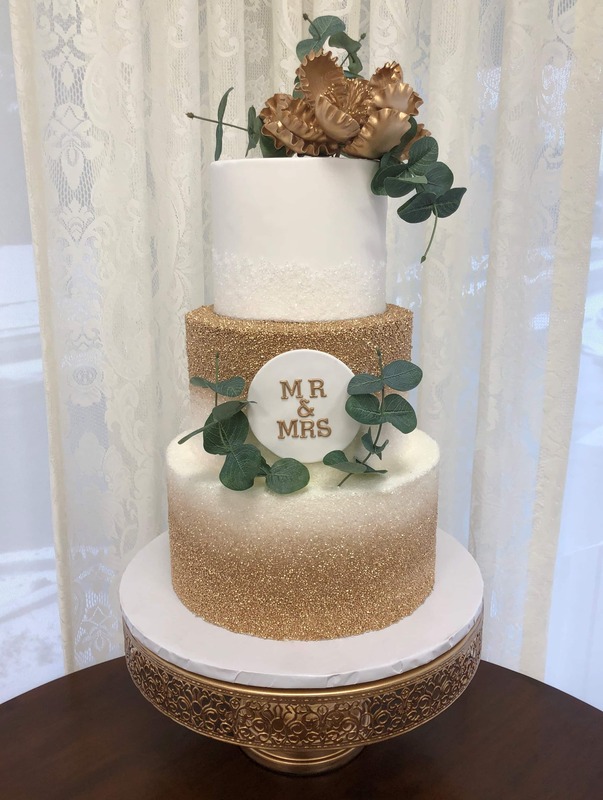 Topped with a gold sugar flower and silk eucalyptus leaves. 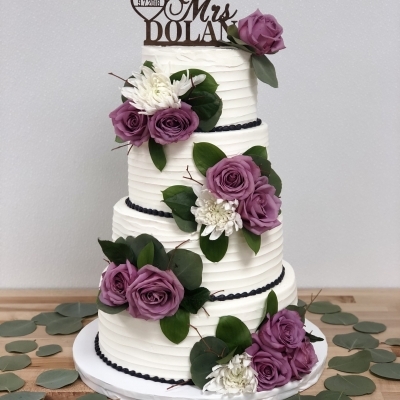 4 tiers textured icing wedding cake, with a dark plum beaded border between the tiers and beautiful fresh flowers accenting all around. 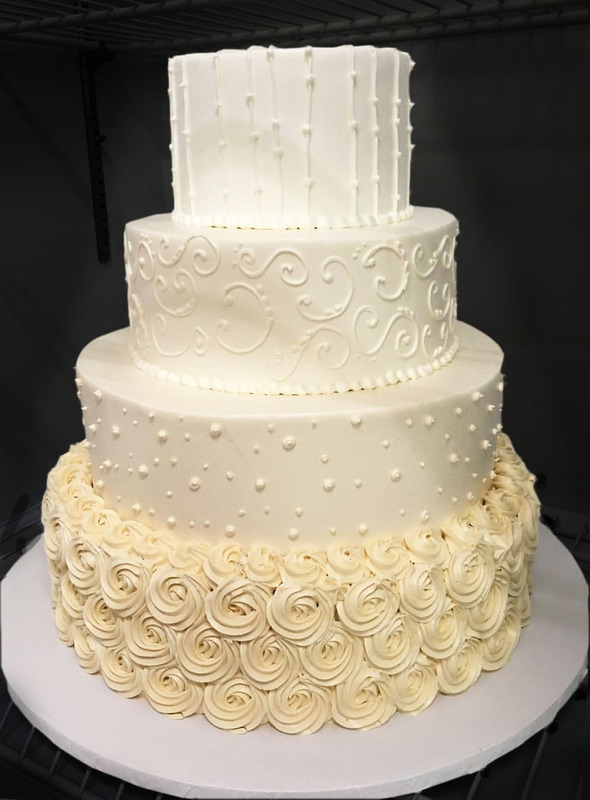 This simple 4 tier wedding cake is iced completely in buttercream and can be topped with any accents to bring your cake dream to life! 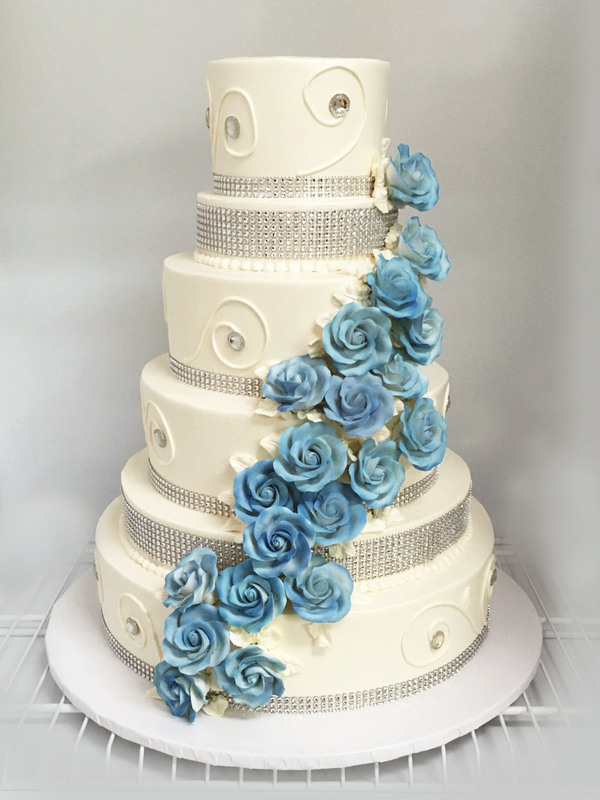 This tall wedding cake has lots of bling and a cascade of dusty blue sugar roses down the front. 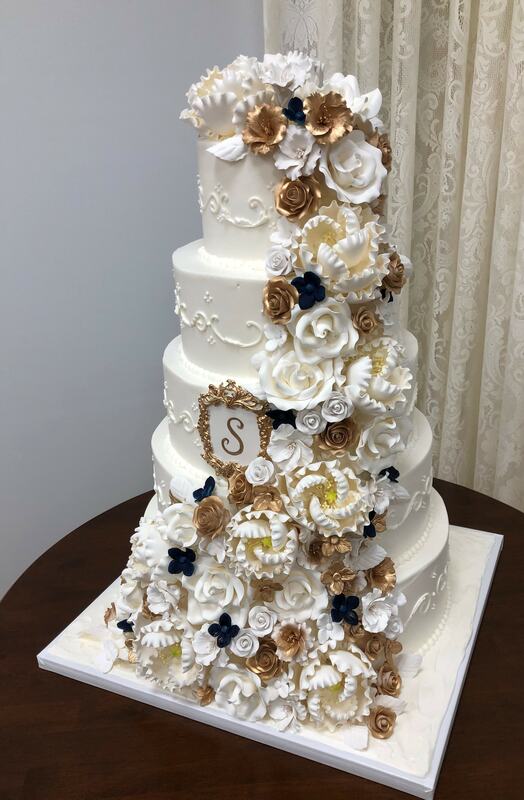 This beautiful 5 tier buttercream iced cake has a gorgeous full cascade of sugar flowers, all different varieties, in white, gold and hints of navy blue. 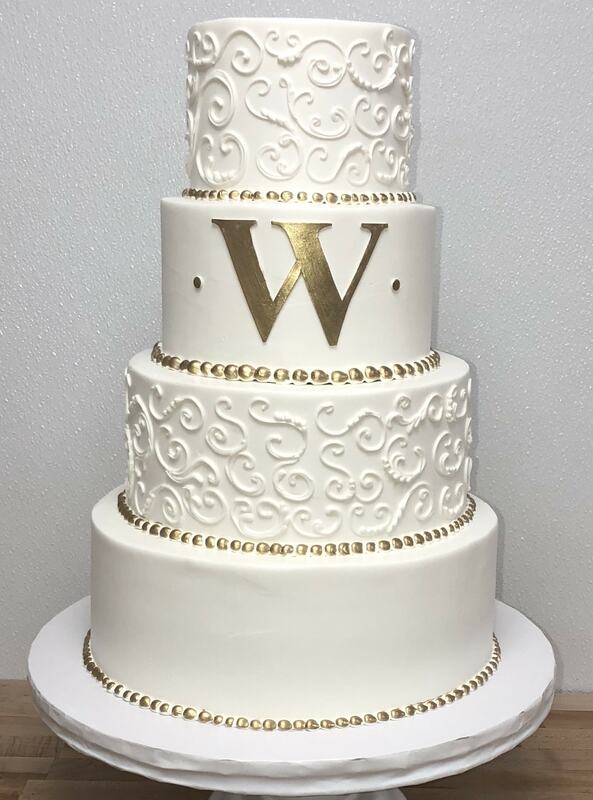 This cake also has a gold fondant framed monogram in the center. 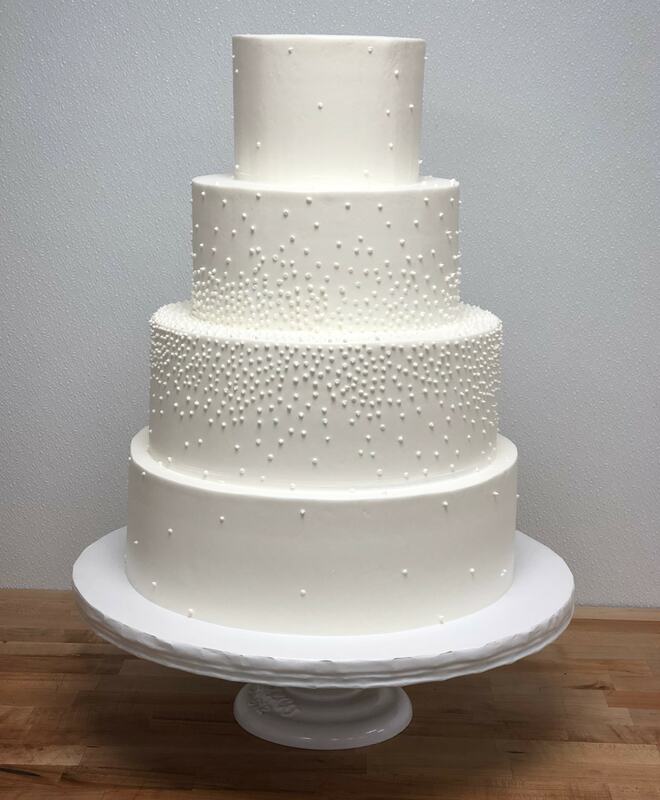 Who says wedding cakes have to be white? 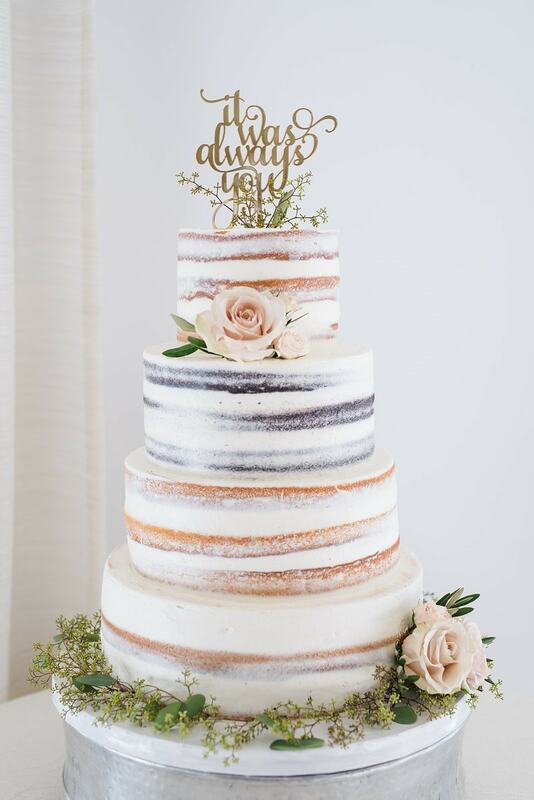 This purple ombre wedding cake starts with a deep eggplant shade on top, fading to a heather purple/gray on the bottom tier. 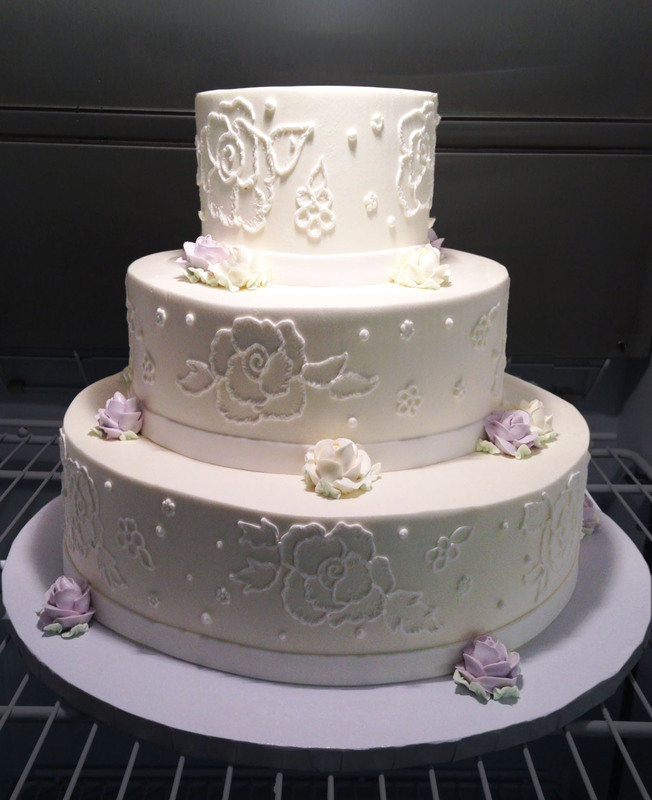 Sugar flowers and a delicate contrasting white piping complete the look. 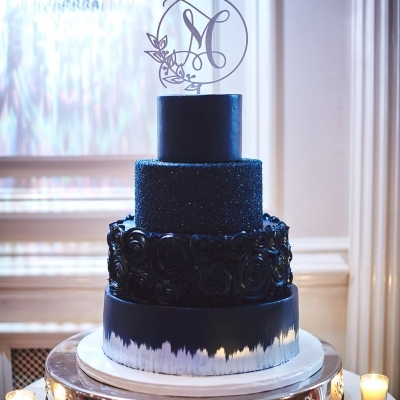 This navy and white wedding cake is iced in smooth buttercream, with artificial lilies cascading down the front. 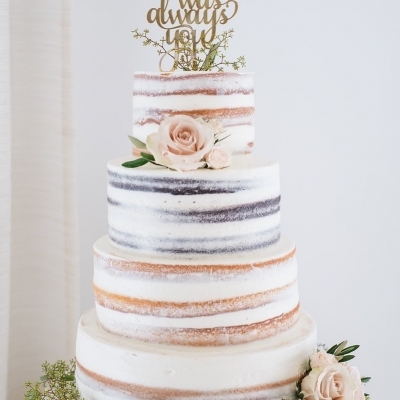 This 4 tier cake has alternating tiers of line textures and stucco-type texture. 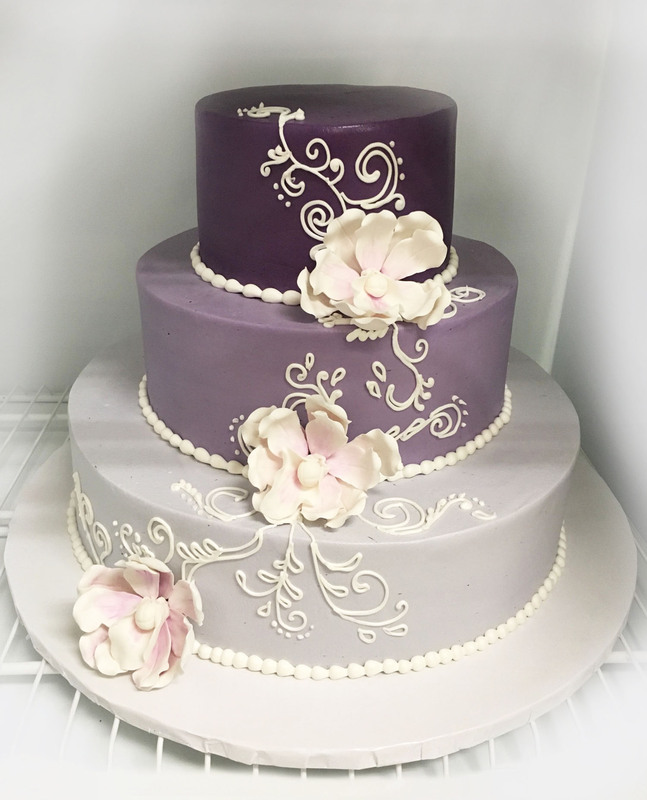 This cake is the perfect base for adding your own personal flair, like a special cake topper or flowers. 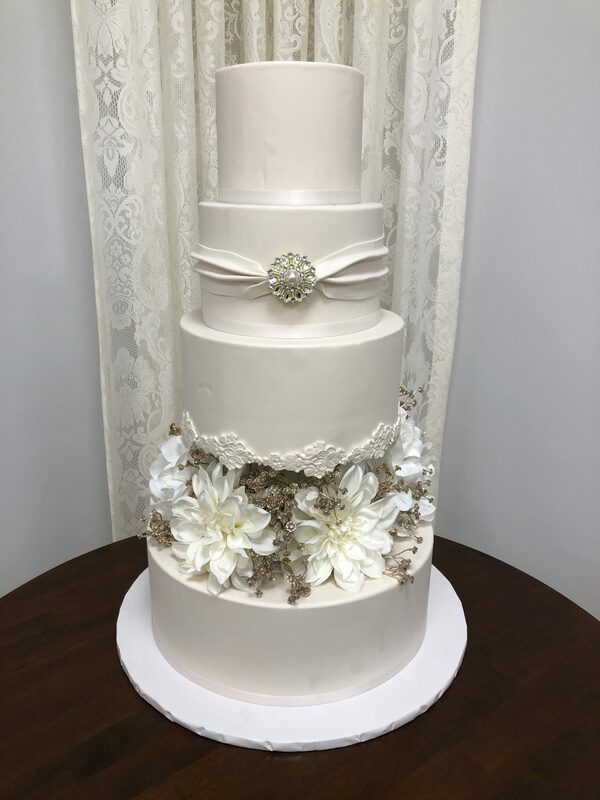 This 4 tier wedding cake has a simple elegance with smooth tiers, a separated bottom tier with flowers in between and a fondant band with diamond broach. 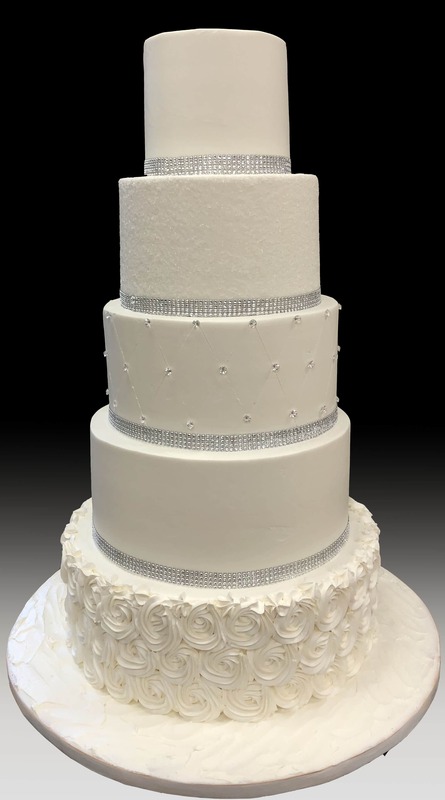 This beautiful white wedding cake has tall tiers, with rosettes on the bottom, a quilted pattern with diamond pins on the middle tier and a crystal sugar tier. Sparkly diamond banding completes the look. 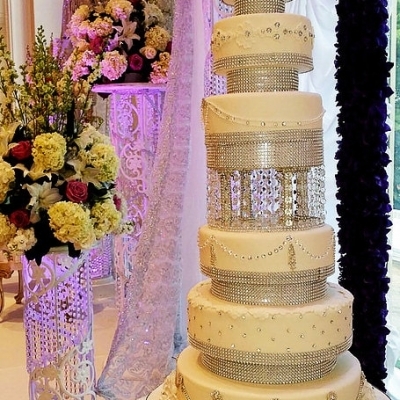 3 semi-naked tiers of chocolate, vanilla and red velvet cake, with fresh fruits and baby's breath. 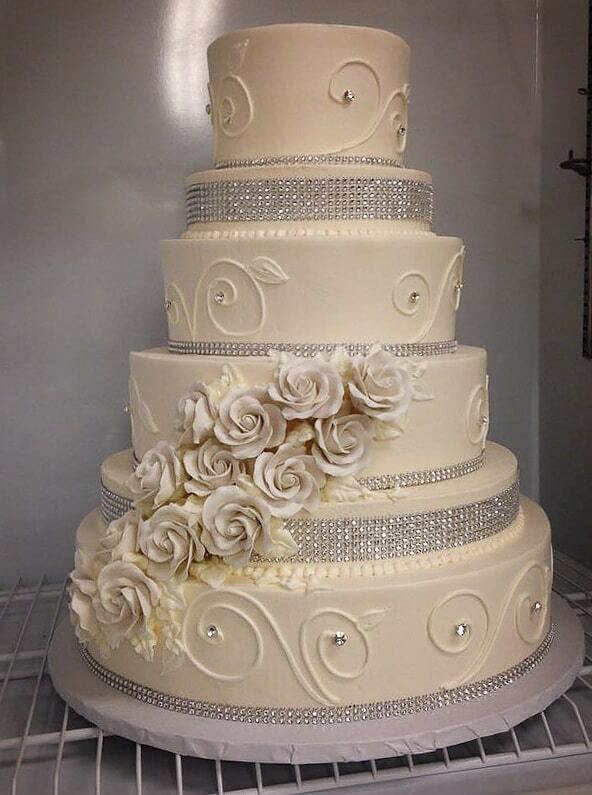 This beautiful 4 tier cake is covered in white fondant, and the middle tiers are accented with edible gold. The look is completed with ivory and deep green artificial flowers. 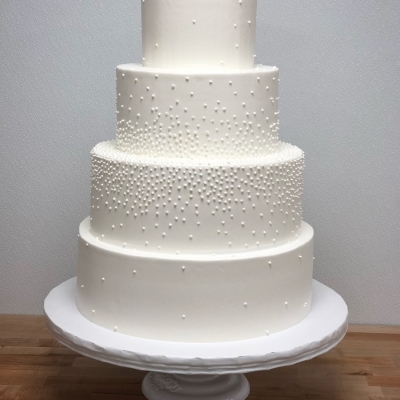 This 4 tier cake has a unique starburst dot design, with the dots concentrated in the center of the cake and scattering towards the edges. 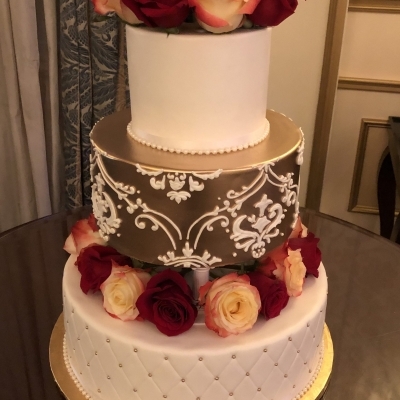 This design is perfectly elegant on its own or add some flowers for extra wow! 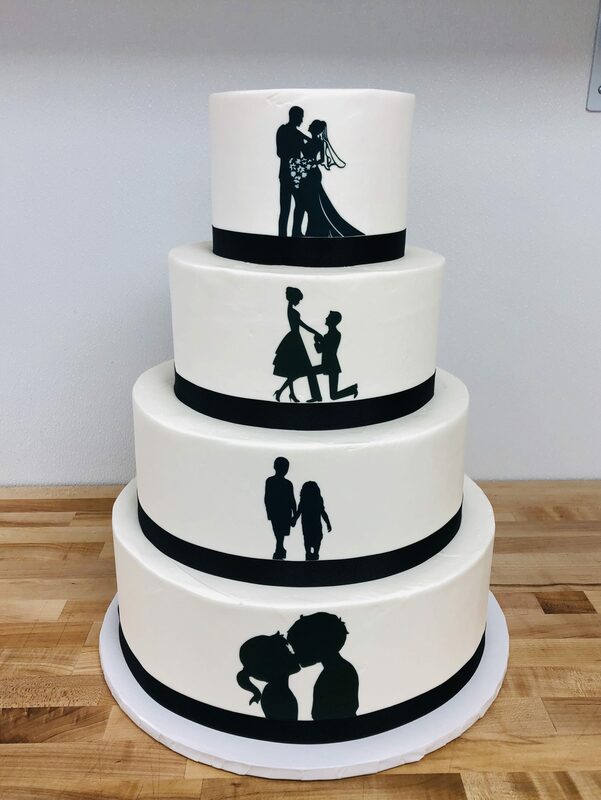 This 4 tier buttercream iced cake features silhouettes to describe the evolution of the bride and grooms relationship. They met as teenagers, had two children, got engaged and then married. 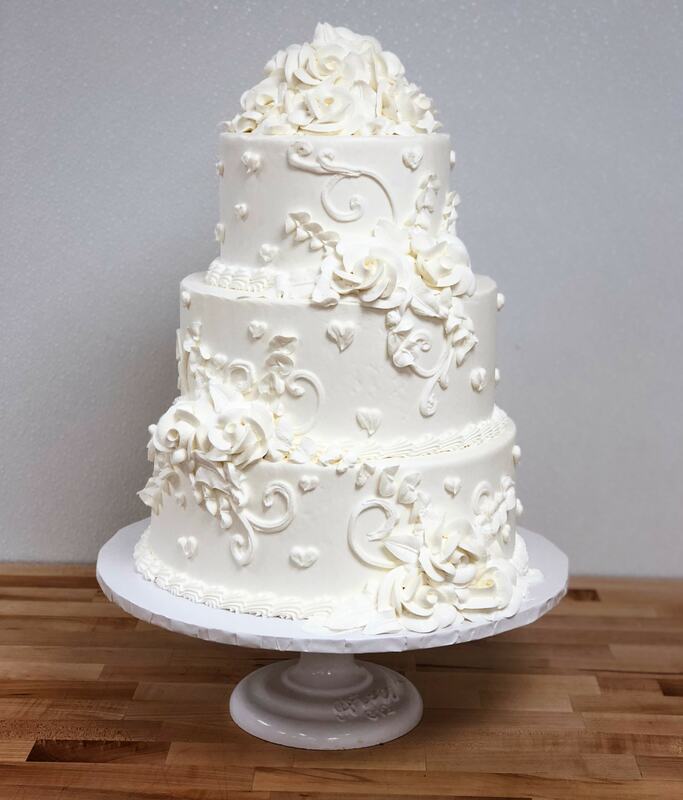 This elegant 4 tier cake has alternating tiers of beautiful intricate piping designs and smooth buttercream icing. 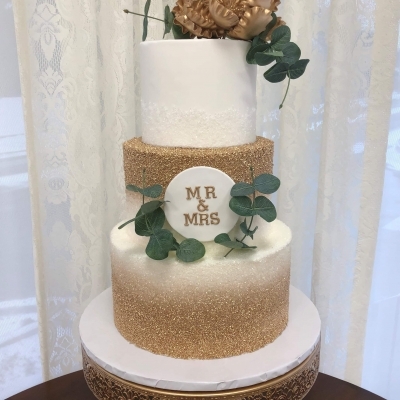 The look is completed with a simple gold monogram and white sugar roses, accented with gold. 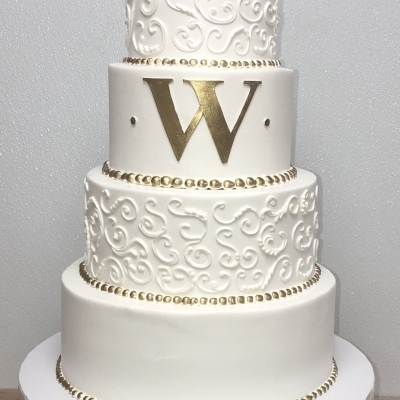 4 tiers iced in white buttercream, with a painted gold beaded border and fondant monogram. 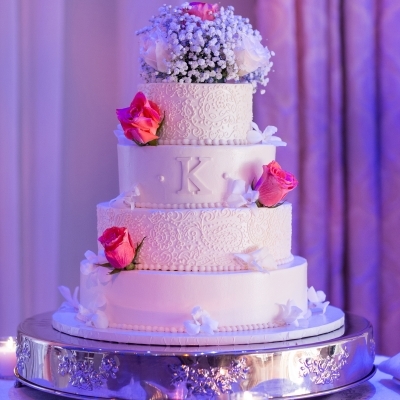 Iced in a pretty shade of ivory, this simple cake is dressed up with artificial flowers. 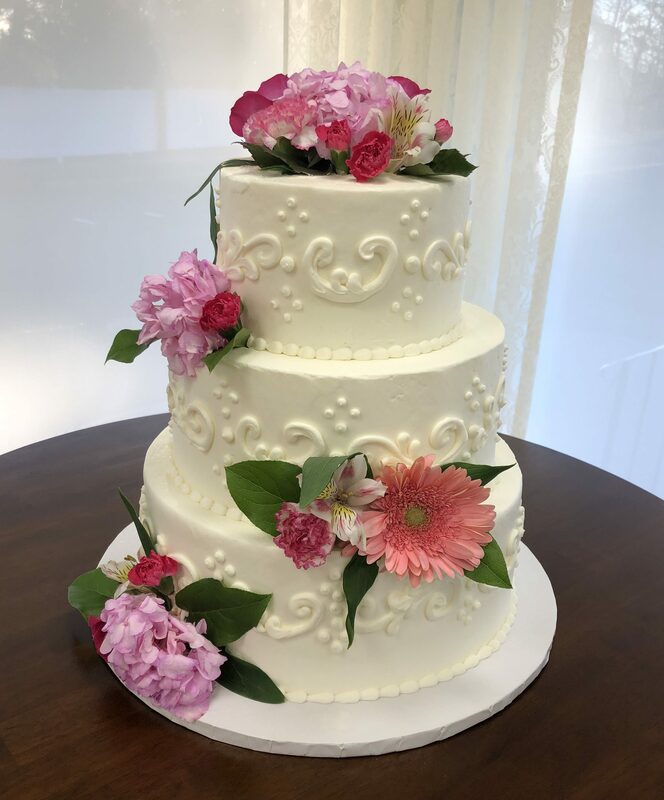 Fresh floral on a 4 tier Ivory wedding cake with detailed piping over lace work. 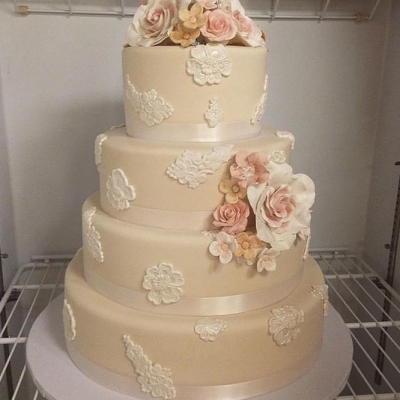 This classic wedding cake design features beautiful buttercream roses with pretty piping. 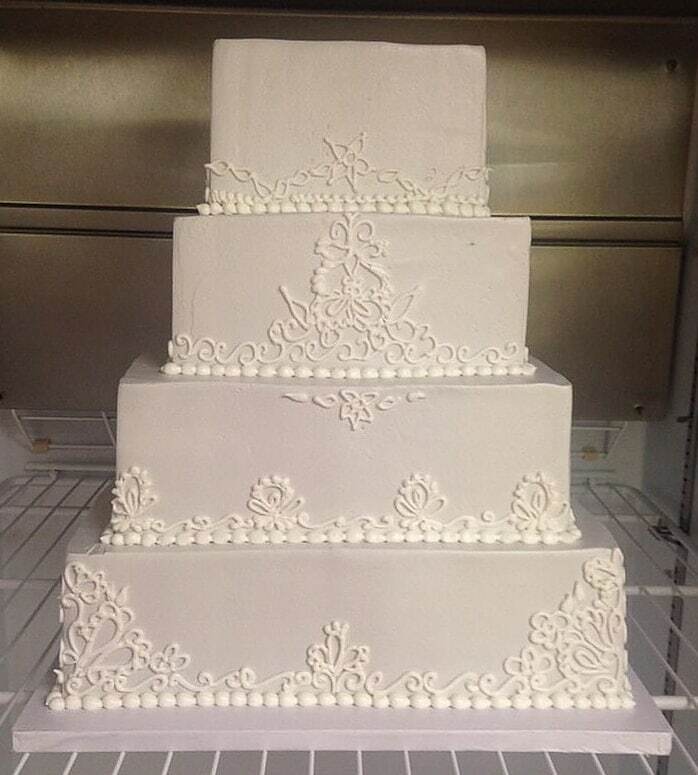 This 4 tier wedding cake is iced in buttercream and has pretty ivory piping and borders. 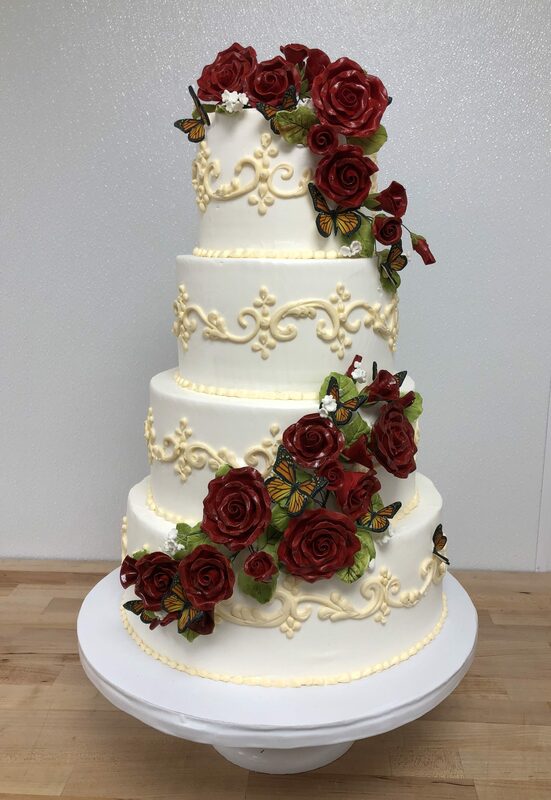 This cake is decorated with deep red sugar roses and has a few fondant butterflies tucked in among the flowers. 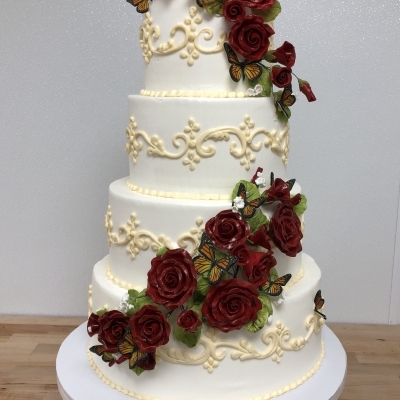 Elegant picture of a custom wedding cake that features dark red sugar roses and carefully placed sugar butterflies. 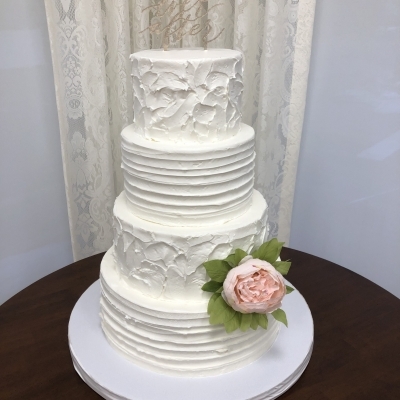 This pretty 3 tier buttercream iced wedding cake is accented with a scrollwork piping design and beautiful fresh flowers. 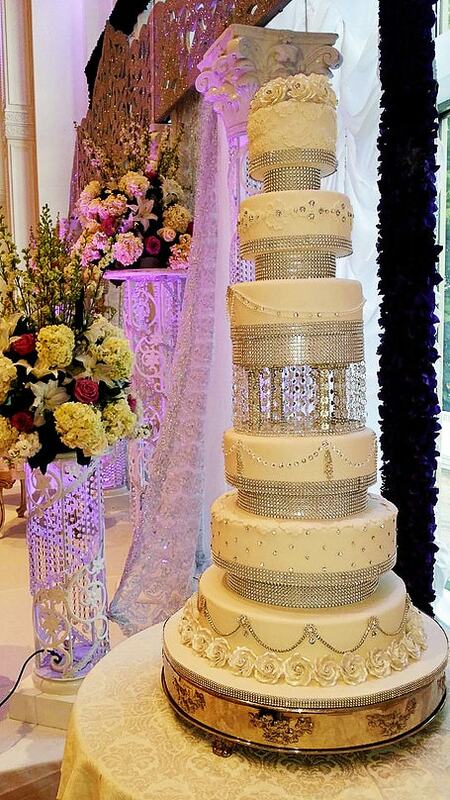 This exquisitely tall wedding cake features 6 tiers of cake, with an additional 5 separators. 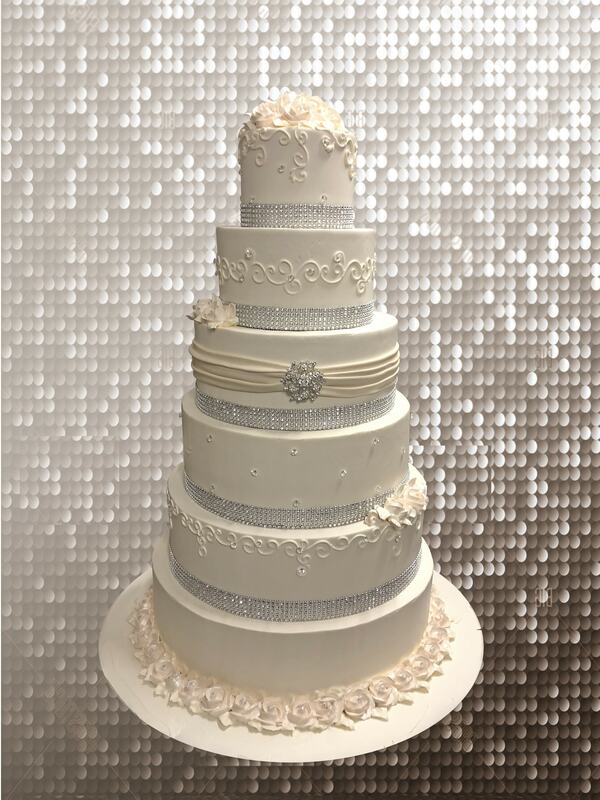 The middle separator is completely covered in crystals and diamond banding for the most impressive sparkle. 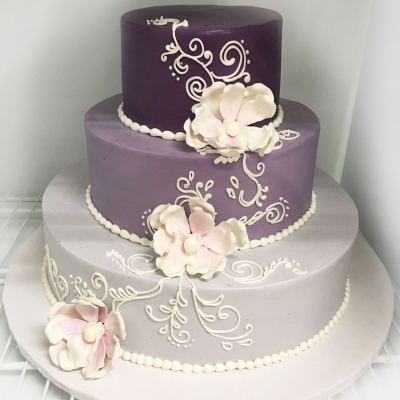 Sugar flowers and fondant appliques complete the look. 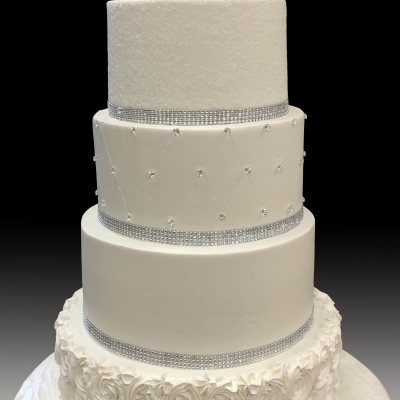 This 6 tier buttercream iced wedding cake has lots of bling, with diamond banding around each tier and a sparkly diamond broach in the center. 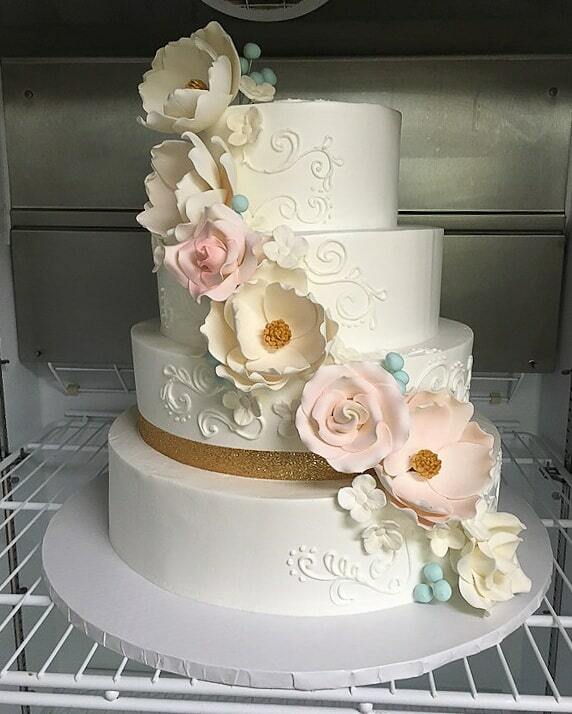 Buttercream roses and piping complete the look. 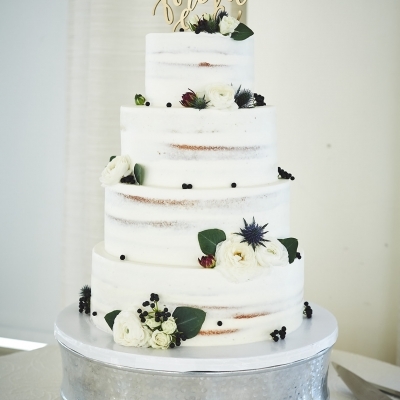 This 4 tier buttercream wedding cake has a rustic, textured icing with gold accents all over. 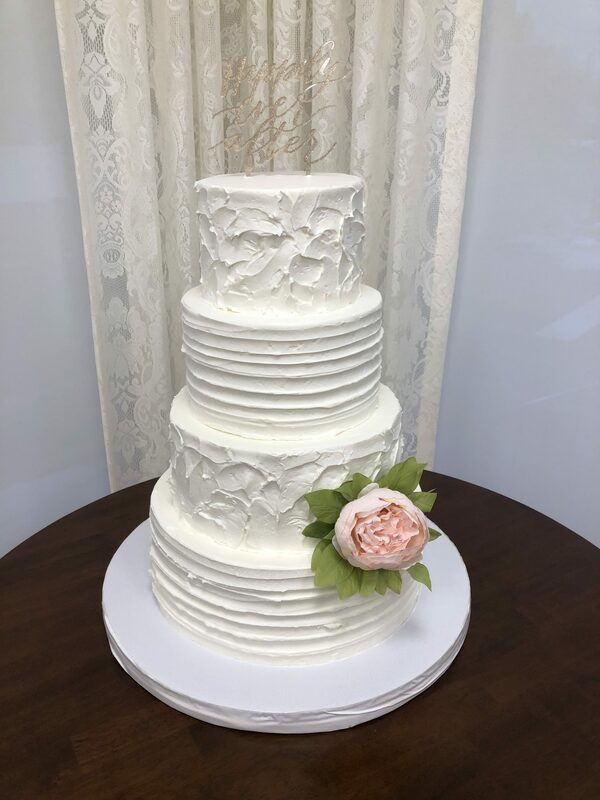 This 4 tier cake is covered in ivory fondant, has a beautiful ivory silk ribbon around the base of each tier, and is accented in pearlized white fondant appliques. 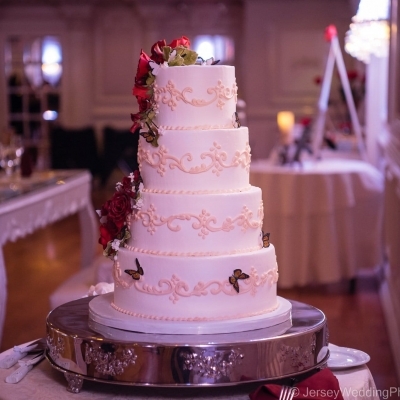 The look is completed with white, blush and pale gold sugar flowers. 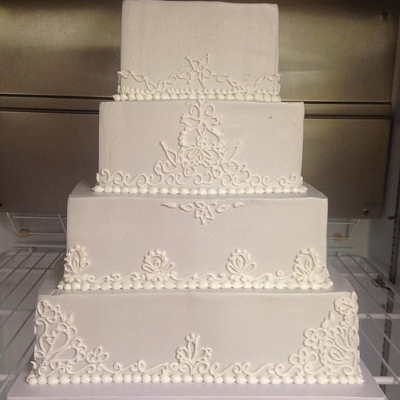 This pale ivory buttercream iced cake has hand drawn buttercream roses in white, mimicking lace appliques. A few white and pale lavender roses create a beautiful vintage look. 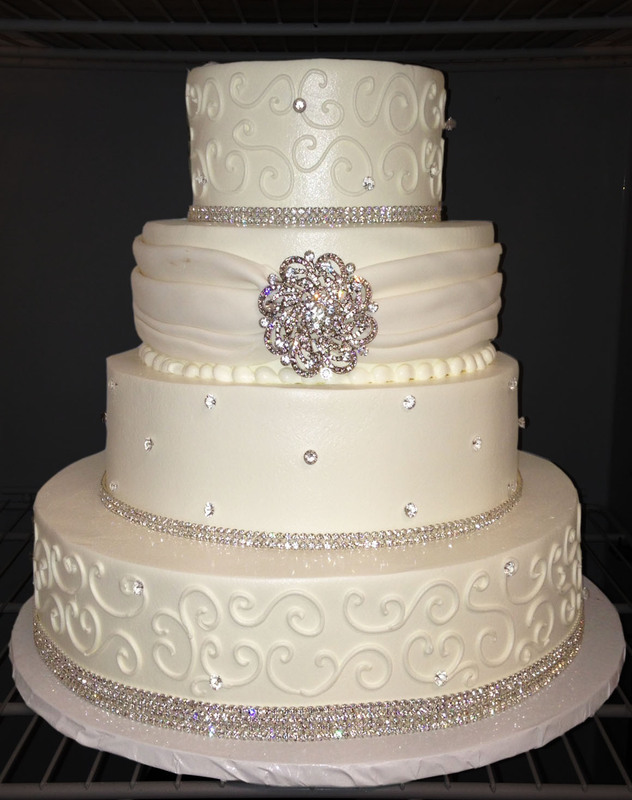 This 6 tier cake features varying full height and low height tiers, with lots of diamond banding for extra sparkle! 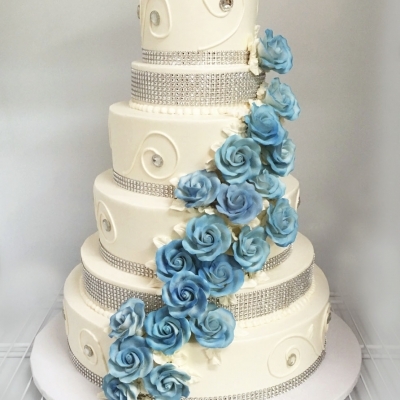 Pretty swirl piping and a bouquet of sugar roses complete this look. 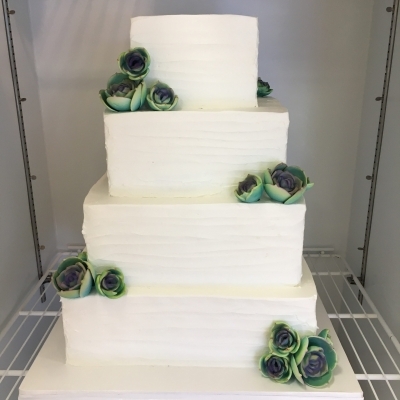 This 4 tier cake is iced with a rustic, textured finish buttercream, and has sugar succulents accenting the tiers. 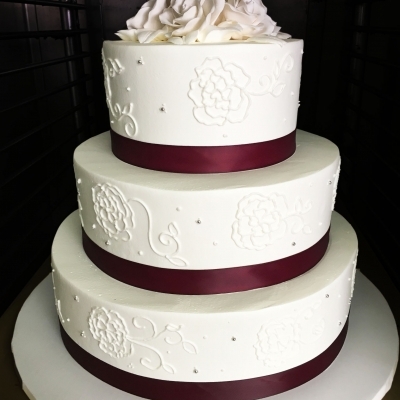 This 4 tier square wedding cake has a beautiful burgundy color ribbon layered with diamond bands around the base of each tier, with a different pretty piping pattern on every layer. 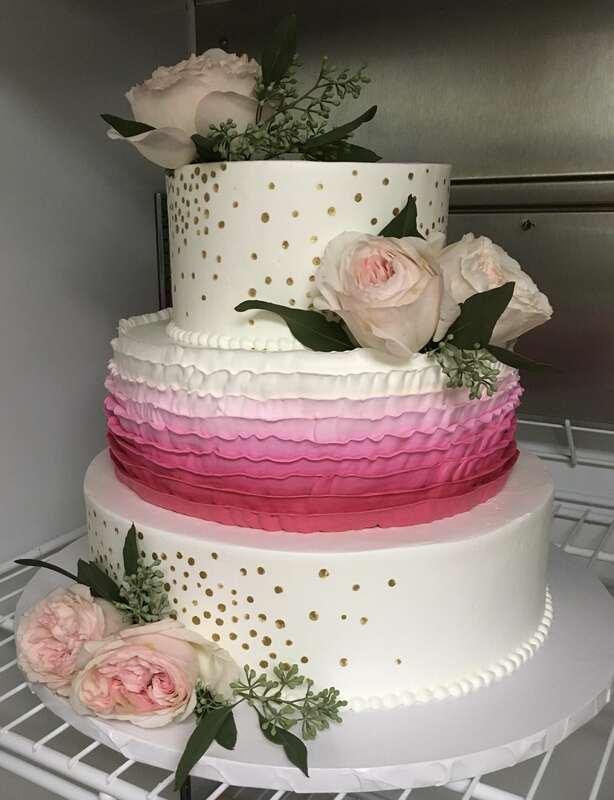 This 3 tier buttercream wedding cake has a statement middle tier covered in ombre pink buttercream ruffles, fresh flowers and painted gold dots. 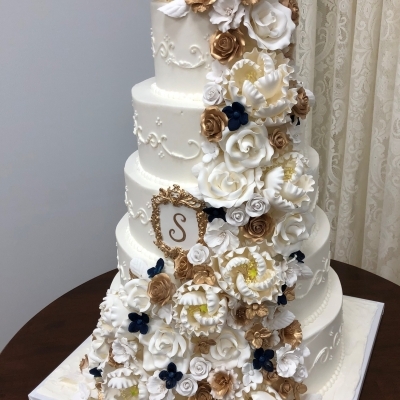 This is a 4 tier, buttercream iced wedding cake with a beautiful cascade of royal blue and white sugar flowers, and when you spin it around, each tier is revealed to have the groom's favorite sports team incorporated onto it. 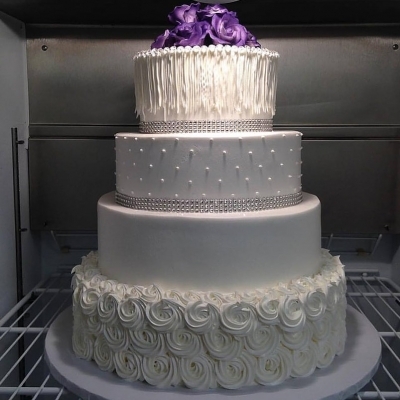 Perfect for combining wedding and groom's cake! 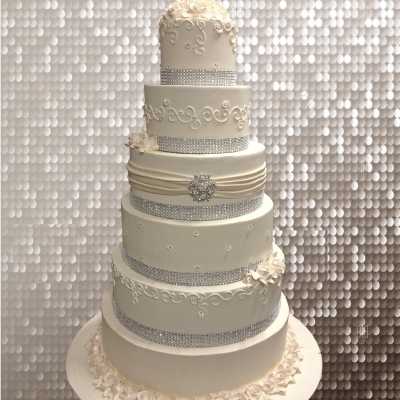 This elegant 4 tier white buttercream iced cake has gorgeous diamond banding around the tiers, with a few diamond pins placed all around. 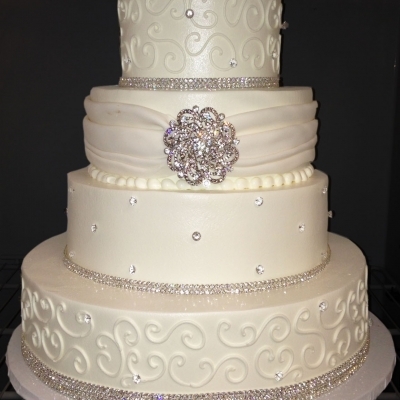 The focal point is the beautiful diamond broach on the middle tier with a fondant wrap. 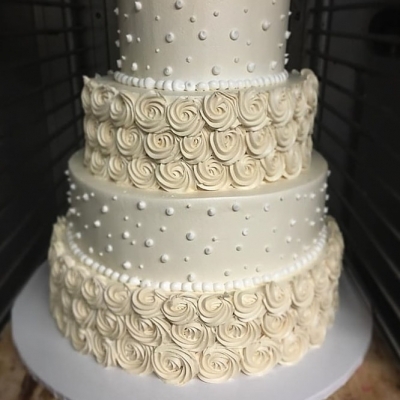 4 tiers of white buttercream iced cake, with alternating tiers of fondant wraps with broaches. 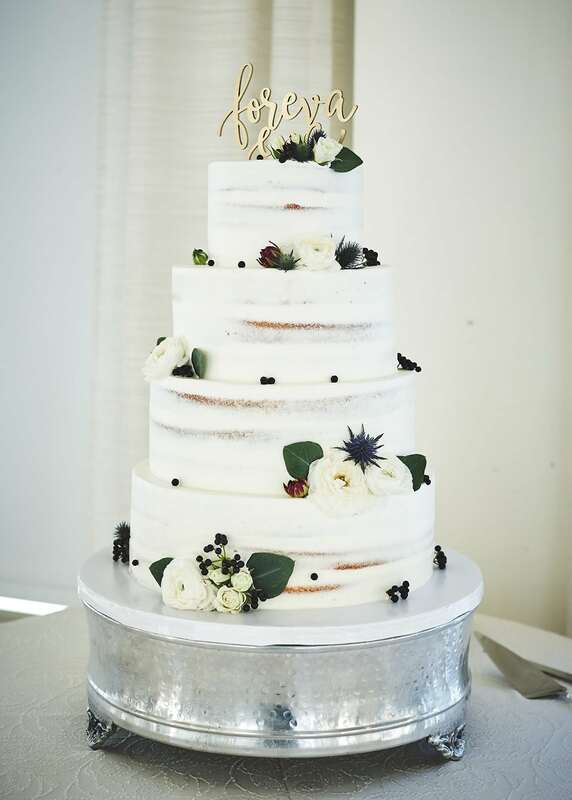 Add a few statement flowers and a topper to make it your own! 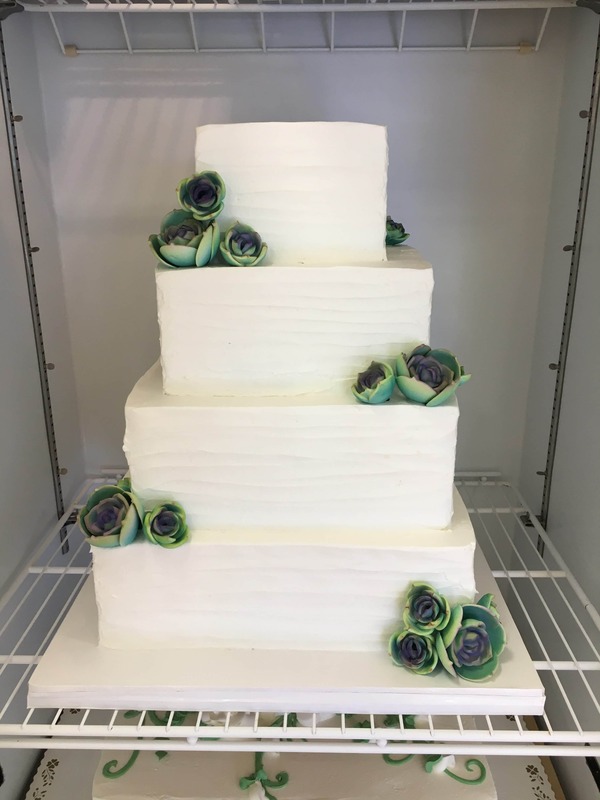 3 tier buttercream iced cake with pretty buttercream swirls, a large lavender fondant bow and diamond banding around each tier. 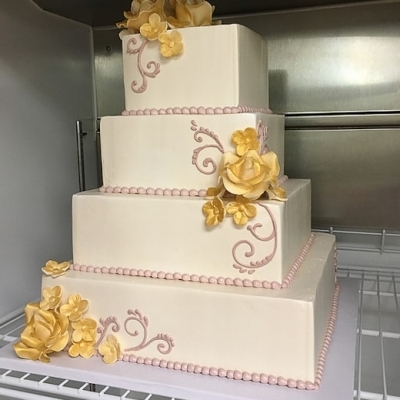 This cake is iced in ivory buttercream, has gold sugar flowers and pale pink trim. 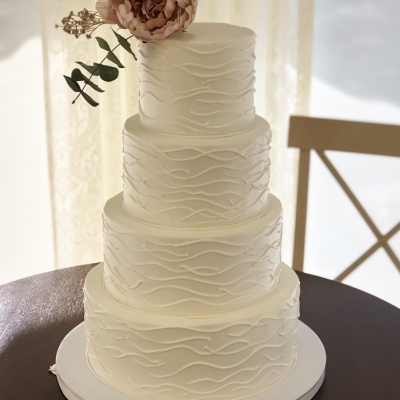 This 4 tier square wedding cake is iced in a trendy pale gray and each tier is designed with a different lace-inspired piping. 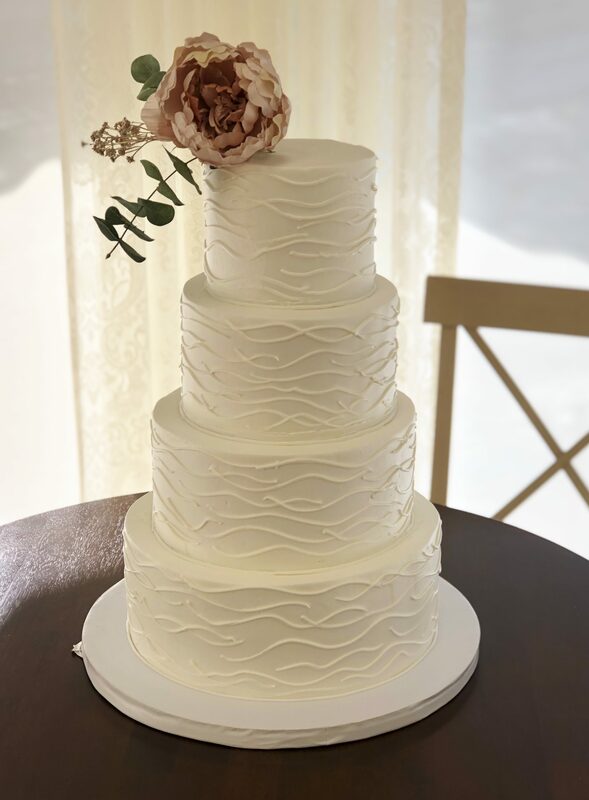 This 4 tier cake has alternating tiers of smooth buttercream icing and a modern horizontal line pattern. The tiers are offset in a staircase design. 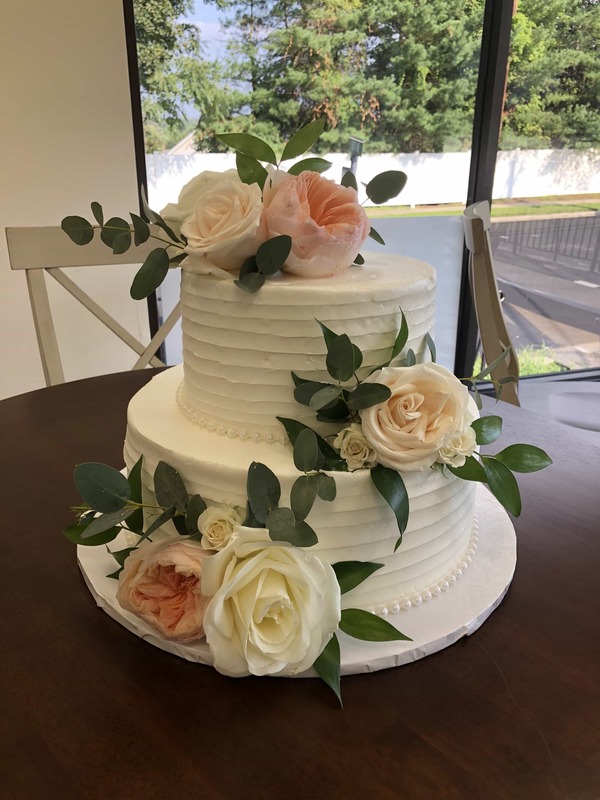 This 4 tier, white buttercream iced cake has a full cascade of blush and ivory sugar flowers, along with hints of gold and mint. A sparkly gold ribbon completes this look. 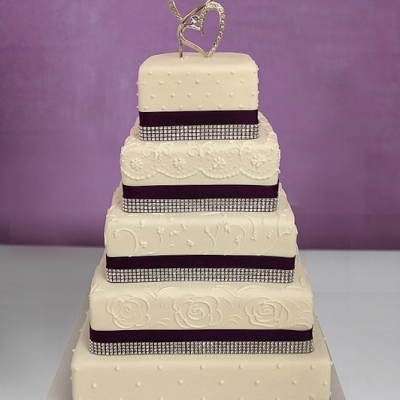 This impressive square 5 tier cake features a black ribbon around the base of each tier with a diamond banding overlay. 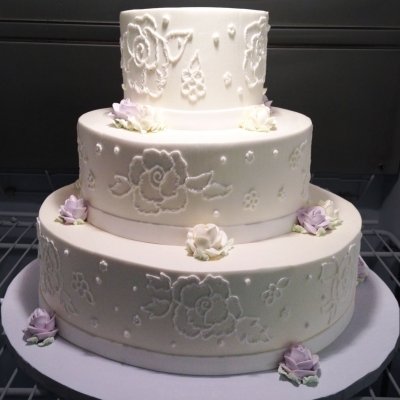 The piping designs vary from tier to tier for a beautiful display. 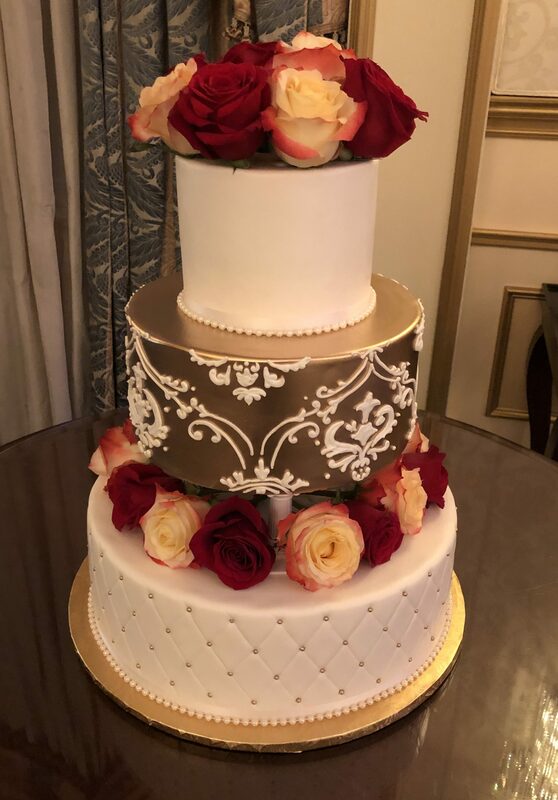 This 3 tier square white buttercream iced cake has 5" separators between the tiers and the spaces are filled with lots of fresh red roses. 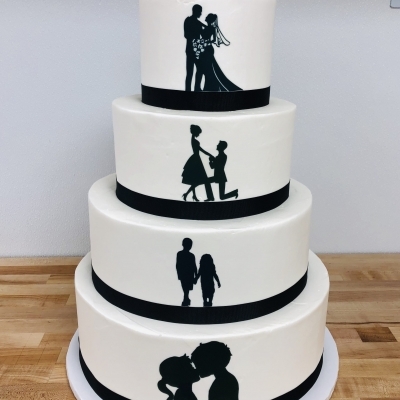 Each tier has a thick black ribbon. 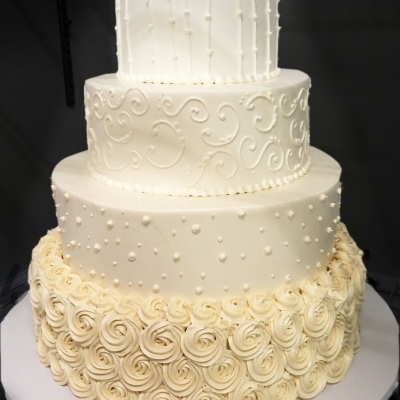 This 4 tier white buttercream iced cake has ivory ribbon around the base of each tier along with ivory drop piping along the top edge of each tier. 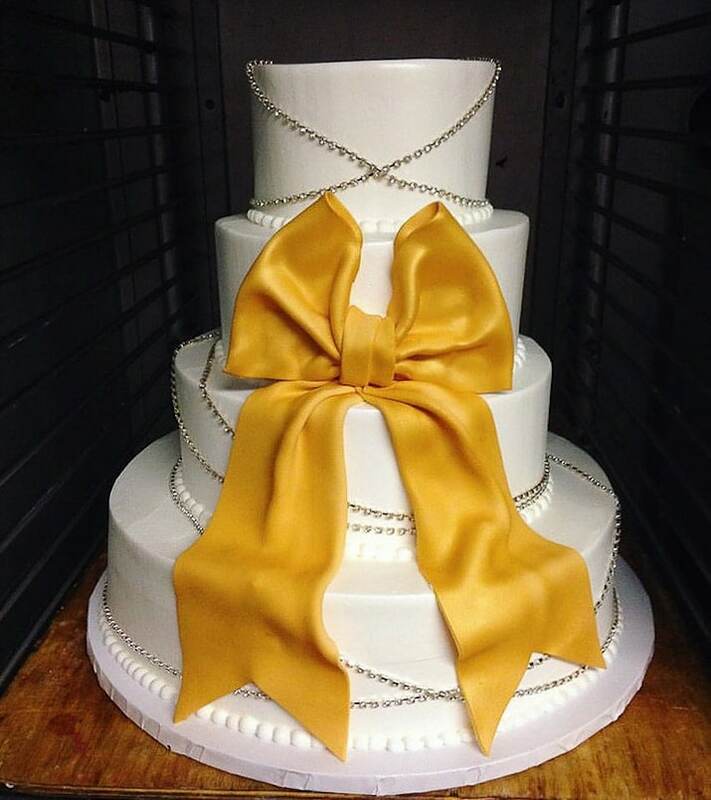 This 4 tier cake is iced in white buttercream, has thin diamond strands criss-crossing across the tiers and a large gold fondant bow in front. 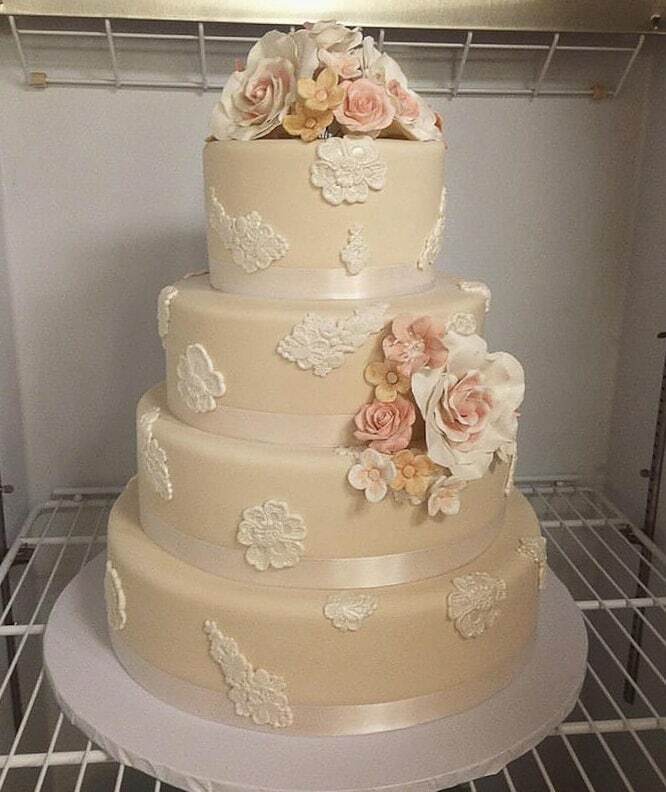 This little 2 tier cake is covered in fondant to achieve the birch bark look. Artificial leaves were added to tie in a fall theme. 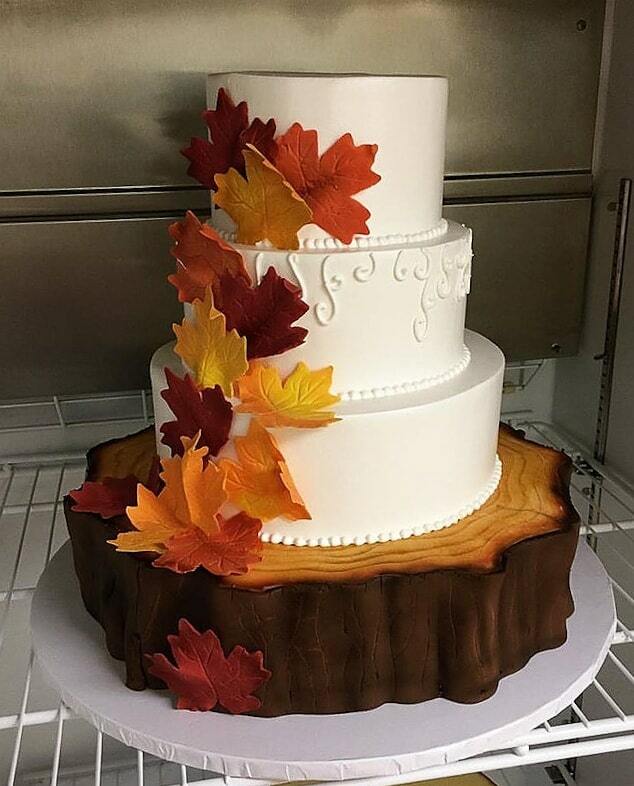 The bottom tier of this 4 tier cake is covered in fondant and sculpted to look like a tree stump! 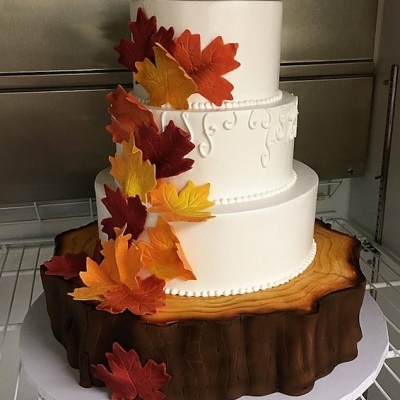 The next 3 tiers are iced in buttercream and accented with fondant fall colored leaves. 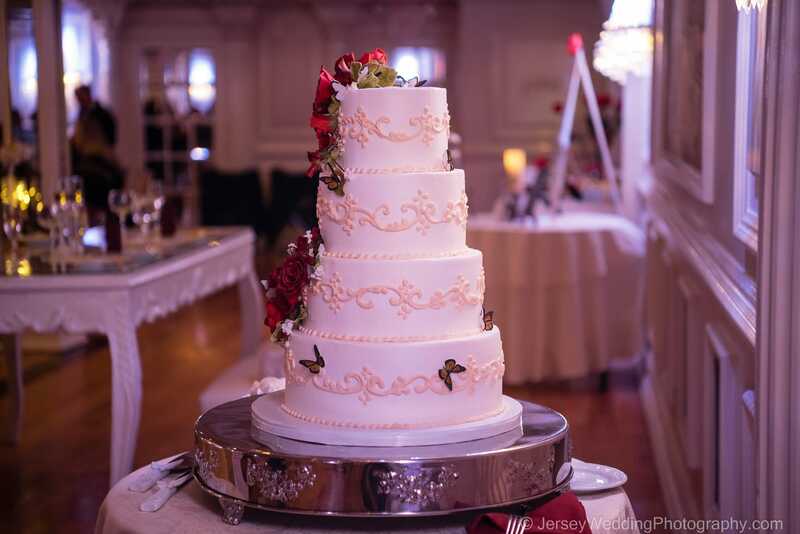 This 4 tier wedding cake has shades of ivory from top to bottom, with different designs on each tier. 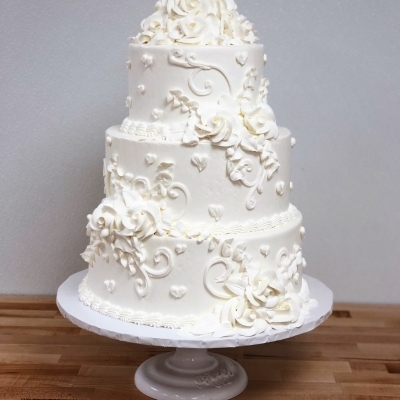 This 4 tier cake alternates between ivory rosettes and an ivory base with white dot design. 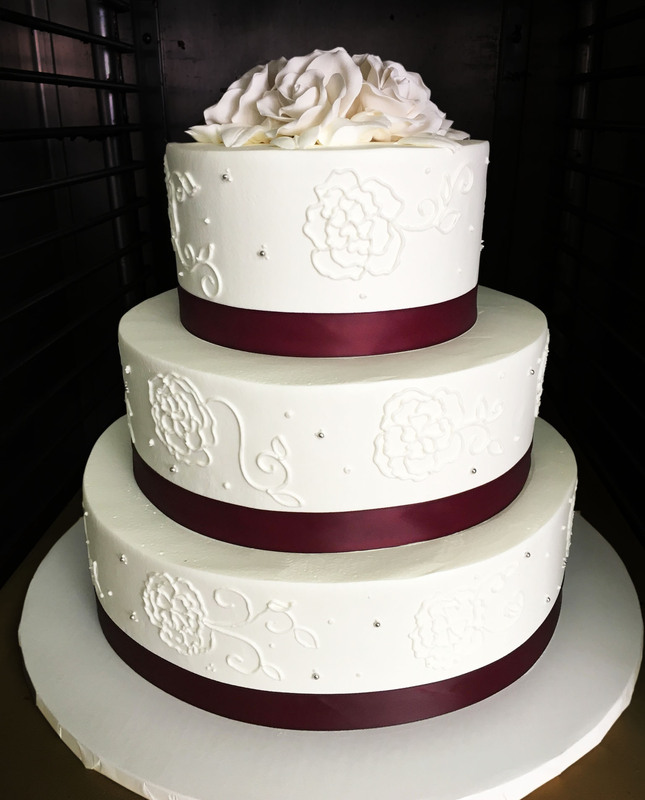 4 tier cake with large rosette design on the bottom tier and dot design on the top 3 tiers. 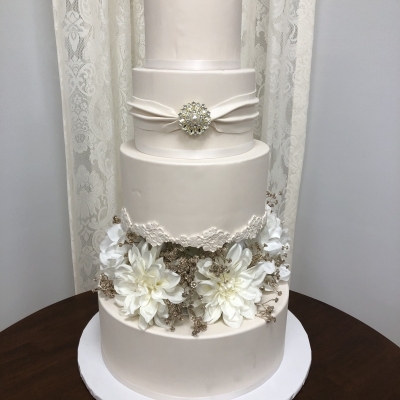 This 4 tier cake has a thick bronze colored ribbon around the base of each tier, along with an overlay of real lace on the bottom two tiers. 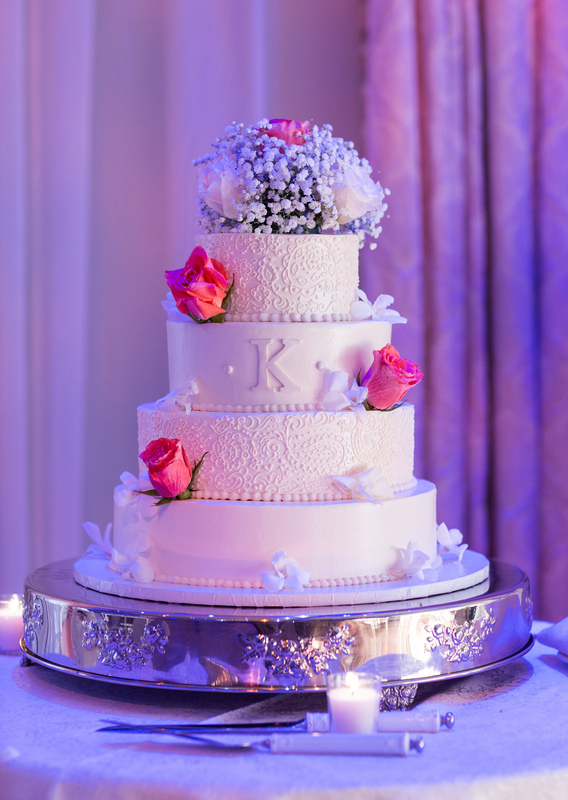 The top two tiers are accented with a lace-inspired piping design. A bow with a large diamond brooch completes the look. 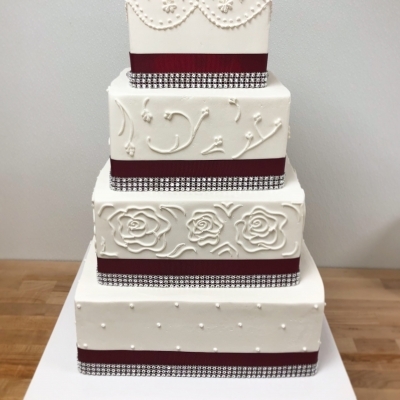 This 4 tier cake features a different design on each tier, starting with rosettes on the bottom, followed by a smooth finished tier, a swiss dot tier with diamond banding and a fringe accented top tier. 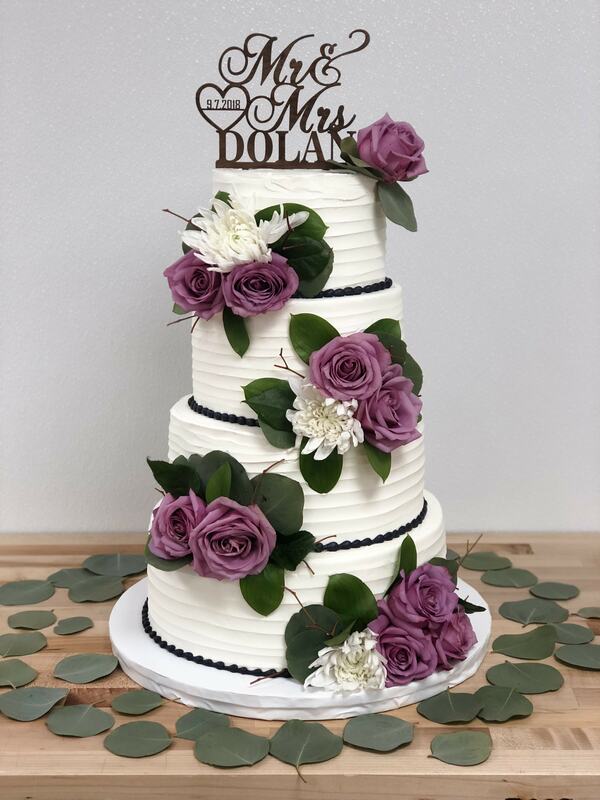 Purple gumpaste roses top the cake. 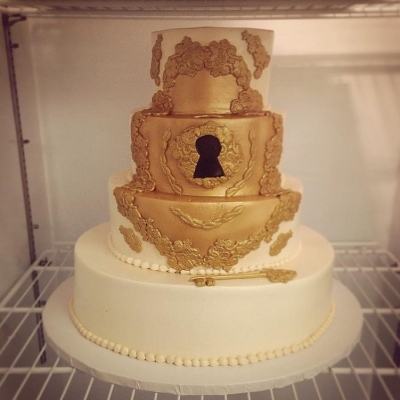 This "Love is the key to happiness" themed wedding cake is iced in buttercream and is accented with gold fondant appliques to create the look of a lock. A fondant key lays on the tier beneath. 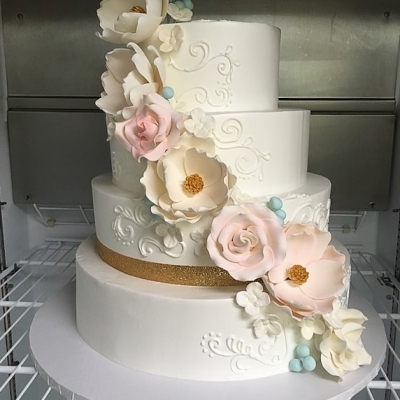 This 4 tier cake is iced in a light blue buttercream and has white fondant seashells accents, along with a white buttercream coral reef piping. 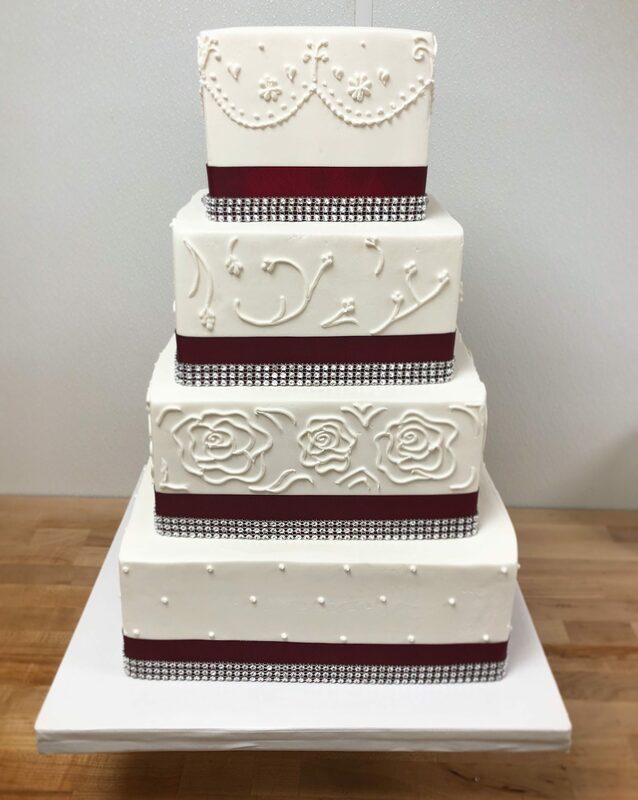 This 3 tier wedding cake has a pretty buttercream rose piping design, with burgundy ribbon and a few silver bead accents. 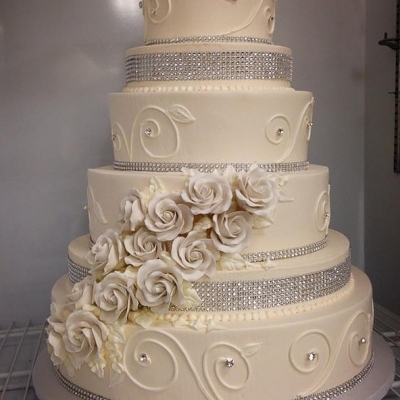 The cake is topped with white sugar roses. 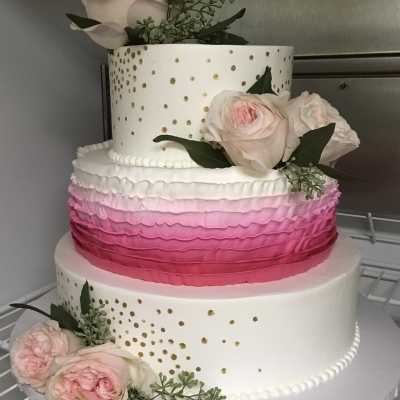 The bottom tier of this wedding cake has a blush colored large rosette design, followed by alternating white and airbrushed gold tiers. 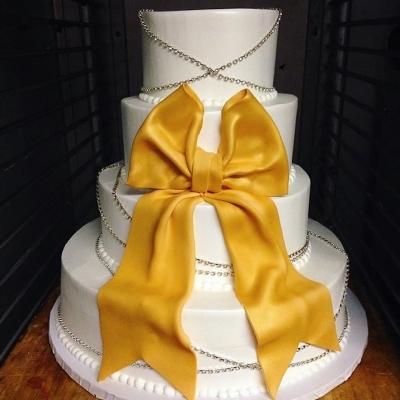 Each tier has a pretty gold ribbon for accent.